With Southern California’s relatively mild winters, motorcycle enthusiasts are able to ride year- round in and around the Long Beach area. While motorcycles are an exciting and efficient way to get from place to place, they also expose riders to an inherent risk of serious bodily injury. In fact, data published by National Highway Traffic Safety Administration (NHTSA) indicates that there were in excess of 80,000 motorcyclists injured in traffic accidents in 2011 alone. When motorcyclists are injured by the negligence of another person, California tort law allows them to recover compensation for their injuries and other losses. 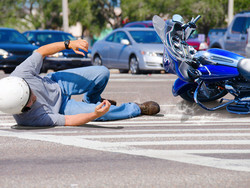 In this case, the assistance of an experienced Long Beach motorcycle accident attorney can be extremely useful. At Jamal Injury Law P.C., we are here to ensure that motorcycle accident victims get the compensation they deserve after an accident occurs. In California, you generally have two years from the date of your injury to file a claim, so be sure to discuss your accident with an experienced Long Beach motorcycle accident attorney as soon as possible to start the process of recovering for your losses. In certain circumstances, the deadline to file suit can be less than two years and therefore it is imperative you consult with a lawyer immediately after an accident. In addition, many of these cases are complex and require legal knowledge to determine whether you have a case. If you suffer from these injuries after an accident, it is in your best interest to discuss the circumstances with a motorcycle accident lawyer with experience in Long Beach. This is because injuries sustained in a motorcycle accident have the potential to result in serious economic and non-economic losses including medical bills, lost income, pain and suffering, and loss of enjoyment of life, among others. Discussing your case with an attorney is often the first step in ensuring you receive the compensation you deserve. After a motorcycle accident, you’ll likely be feeling overwhelmed, but it is incredibly important that you not only seek medical attention, but assistance from an experienced lawyer who can help you understand your rights. At Jamal Injury Law P.C., we are dedicated to personalized client service and obtaining the highest possible settlement or award in your case. To schedule a free consultation, call our office today at 714-907-1021. You can also fill out the information requested in our “Contact Form” and a motorcycle accident lawyer serving Long Beach will contact you directly.